Martyn and I have eaten our fair share of burgers since we met. We often opt for a burger when eating out, whether that's grabbing a quick bite to eat or having a date night and have tried pretty much all of the burger offerings in Cardiff at some point. 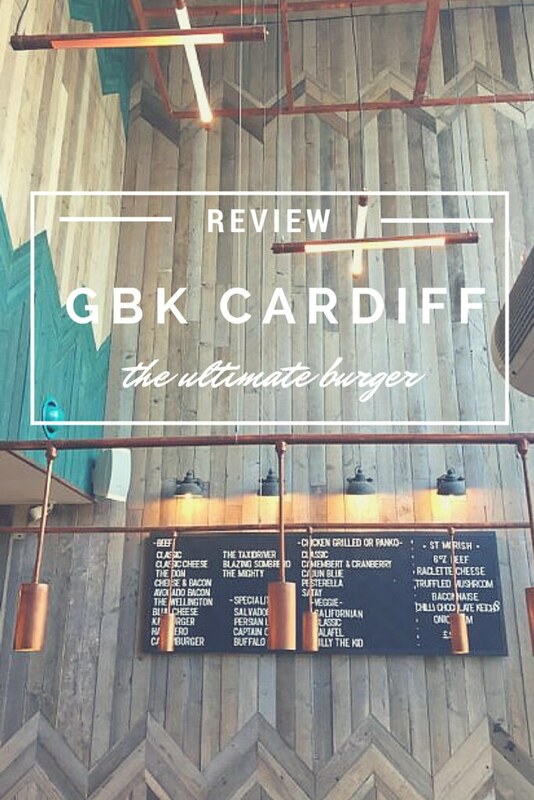 I've eaten at Gourmet Burger Kitchen in Birmingham a few times previously but I was looking forward to going back and seeing what they offer now, especially since so many big burger chains have opened in Cardiff recently like Shake Shack and Five Guys. How would GBK stack up against its competitors? Before I delve in to what I thought about my food I'll share the history of the company. Back in 2001, three Kiwi guys set up the first Gourmet Burger Kitchen in Battersea, South London. Now with over 60 restaurants across the UK, GBK still pride themselves on serving up a variety of handcrafted burgers, combining 100% prime beef, hand selected and traditionally reared on independent farms across the South West counties with the freshest ingredients and sauces made from scratch, every day, in each GBK kitchen. When it came to order Martyn opted for the Old Colonial which is the current 'special'. It is a 30 day dry-aged steak burger with Red Leicester cheese, crispy bacon, pickles, Bangkok slaw and beef ketchup. Martyn said this was right up there with his all time favourite burgers and he would definitely chose this again. Our waitress told us that the burger had proved so popular it is going to be added to the permanent menu when it gets its next seasonal change. The burger was perfectly cooked, (medium), just how Martyn likes it. Both Martyn and I were stuffed after our burgers and couldn't finish our fries but I made sure I tried some of the perfectly crisp cheese and truffle chips. The garlic mayo dip was freshly prepared on site that day and was a hit with both myself and Martyn. GBK offer lunch time menu with slightly smaller portions which I would definitely opt for next time if I visited early in the day. I have yes bigger than my belly! 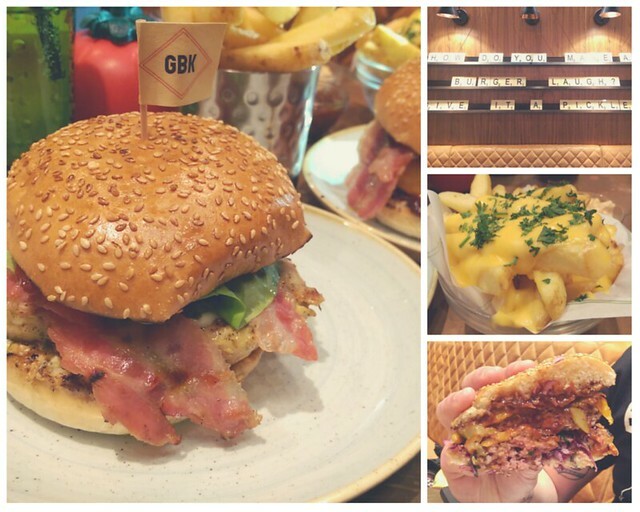 Gourmet Burger Kitchen does retain a casual, takeaway vibe and you pay at the counter when you order as you would at any fast food joint but the seating and atmosphere gives it more of a restaurant feel. You aren't surrounded by groups of teenagers throwing fries and they were playing some Northern Soul songs when we arrived so I felt at home. I had a lovely time at GBK Cardiff Library with Martyn and I'm sure I'll return in the near future. *This post was written in collaboration with St David's. The meal was provided for review purposes but all views are my own as always. Ah wow now I'm desperate for a burger. It looks incredible. Sounds like you had a great meal!